A short while ago, I reviewed Moodagent, Syntonetic’s app that suggests music stored on your iPhone or iPod touch based on your current mood. I was skeptical at first but the app’s uncanny accuracy quickly won me over. A lot’s changed since February. Moodagent underwent a major update and since split into two versions—Moodagent Free and the $5 Moodagent I thought I would give the apps a second look to see if my mood had changed. In the Mood for Music: Even after a major update, Moodagent works as before, generating a playlist based on the emotional qualities and tempo you select. 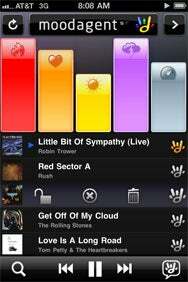 But now you can lock songs into playlists or remove them altogether. The basic premise with Moodagent remains the same: drag five sliders, each representing various emotional qualities or tempo, and the app will recommend a playlist of songs representing that mood. The difference between the free and paid versions of the app? Moodagent Free includes advertising; the $5 version doesn’t. Otherwise, it’s a feature-for-feature match. So hats off to Syntonetic for only placing ads in the free version and not reducing the features. If you’re like me, and occasionally need some help breaking out of a musical rut, Moodagent is still an excellent, and more functional, alternative to iTunes’ Genius Playlist.